Reviewer Profile – Meredith M.
I was born in Omaha; as a child I lived in Ralston, Alliance and Wayne, Nebraska. I graduated from Wayne High and Wayne State, then moving to Lincoln. I married my husband, Tom, in 1971; we’ve lived in Washington, DC (while Tom was in the Army), Lincoln, Omaha, Terre Haute, Indiana, where we adopted our daughter and son, Tempe, Arizona, and back to Lincoln. I keep coming back to Lincoln! When I was young, I remember spending time in the Wayne Public Library; I enjoyed reading Nancy Drew, Trixie Belden, the Bobbsie Twins. Apparently, I liked series. I did work in the library while going to college at Wayne State; I’m sure that had some influence on my getting an MLS at Indiana University-Bloomington in 1988. I have read most of my life, but it’s more as an adult that I have a book or two in my pile to read at all times. Because I’ve worked in libraries most of my life, it seems like I should read; I’m still more interested in the paper versions, too. Having worked in school and public libraries, often with children, books and reading are very important to me. I try to share that with people; in order to get better at anything, you have to practice. Definitely true with reading. In my current job, as Curator of the Jane Pope Geske Heritage Room of Nebraska Authors, I find myself reading a lot of books by Nebraska authors. Most of my book talks, presentations, etc. feature the writings of Nebraskans. It’s a pleasure to share the state’s strong literary heritage with anyone who will listen! Again, I like to promote Nebraska authors, so this gives me a chance to share new and older titles as well. Since moving back to Lincoln in 2002, I’ve held several positions. In 2003, I first worked for LCL as a summer employee, taking the summer reading program out to sites around Lancaster County. I learned a lot about the county and which towns were where; I had a lot of fun. I did various forms of summer county work for several years; I also worked at Walt Library before becoming the Curator of the Heritage Room at Bennett Martin Public Library in 2005. About the time I was working at the Sullivan County Public Library in Indiana, Sue Grafton published the first mystery in her alphabetical series, A is for Alibi. I thought at the time, that’s job security, 25 more books! Now she’s published V is for Vengeance and anticipates the publication of W is for Wasted! Yes, I do like series! Do you have a favorite literary-related website you like to visit or that you’d like to recommend? Of course, I would suggest that you check out the Heritage Room website! One author…Now that’s a hard question! 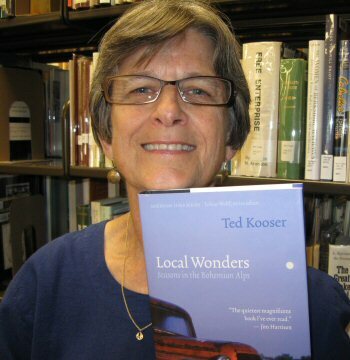 Let me say that one book that I really identify with is Ted Kooser’s Local Wonders. He mentioned so many things that rang true with me; perhaps you have to be a Nebraskan to appreciate the stories, but maybe not. I would suggest that you read this, if you haven’t already; it was the 2011 One Book One Nebraska selection. Also do read some of his other books. He won a Pulitzer Prize for Delights and Shadows and served as the Poet Laureate Consultant in Poetry to the Library of Congress or as we more commonly say, the United States Poet Laureate from 2004-2006. He’s the only Great Plains poet who has been appointed to this position!